Electro coagulation is the removal of dilated capillaries by coagulating blood (the transformation of fluids into solid matter) using heat produced by an electric current, a mild current to induce coagulation within the distended capillary. The body then absorbs the unused capillary. This treatment is called Capillary Coalysis, the processed by which unsightly, distended capillaries are absorbed and eliminated by the body. -Broken capillaries are tiny dilated blood vessels that are visible through the skin. -Rudy points are bright red vascular blemishes which lie under the surface of the skin. They are dome shaped or slightly raised. -Spider Angioma is a combination of a ruby point and a single dilated capillary. -A skin tag is a small benign growth of skin that protrudes from the surrounding skin. 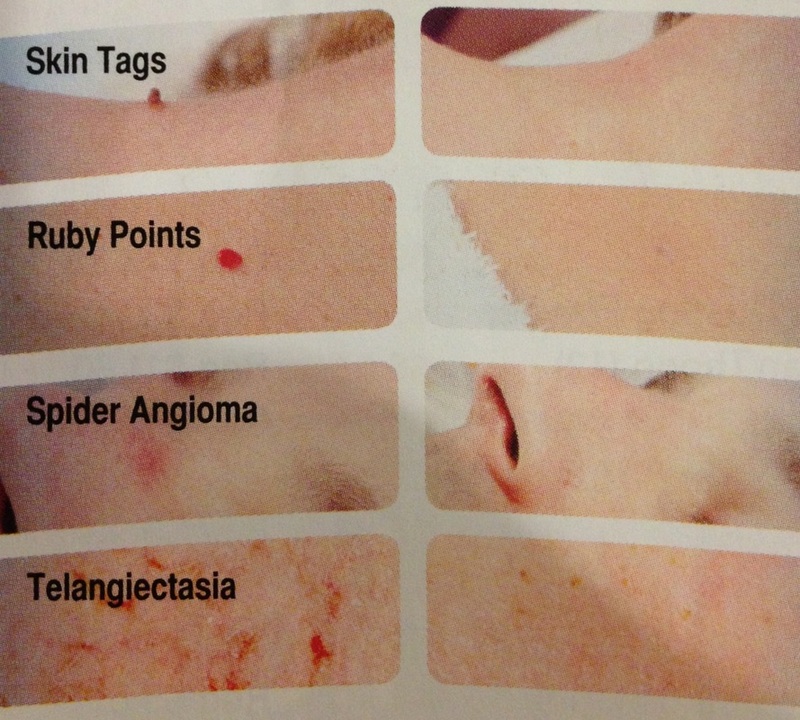 Skin tags may vary in appearance; they are often raised form the skin, flesh coloured or slightly brownish. Most common on the eyelids, neck, arm pits, upper chest, under breasts and groin area. Congenital weakness of the blood vessel walls. Affects mostly fair skinned individuals. Affects 15% of the population. Sun exposure, Excessive heat-Saunas, Chemical peels (heat induced treatments), Injuries- where the subsurface tissues are injured but the skin is not broken; bruises, aggressive pinching, ect., Surgery-Telangiectasia in scar tissue, Retinol- Over use of vitamin A.
Menopause and Pregnancy- Increased blood volume, problem may disappear after birth. High blood pressure, Scleroderma- a disease in which connective tissue anywhere in the body becomes hardened and rigid, Reynaud’s syndrome- poor circulation, Lupus- “butterfly rash”- A chronic skin disorder of unknown cause, Rosacea- a chronic form of acne affecting the nose, forehead and cheeks by red pustular lesions, Alcoholism- alcohol dilates blood vessels and causes premature aging and loss of elasticity of the skin. The non- invasive procedure is virtually painless. Some patients may feel a slight pricking sensation. Sessions are between five to fifteen minutes in length. Most conditions are effectively treated in between one to three sessions. The results are truly amazing. Treated Capillaries or skin tags with not return. New ones may appear somewhere else. YES! The treatment is performed by a certified technician; a disposable and sterile filament is used. Skin reaction after the treatment is minimal and will disappear within a few days.